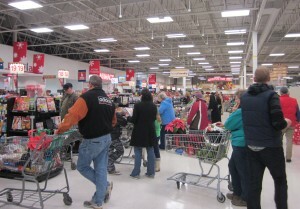 Fred Meyer seemed downright quiet without Elvis today. Of course, it was anything but. I finally got out of there after what seemed like an interminable wait to check out. 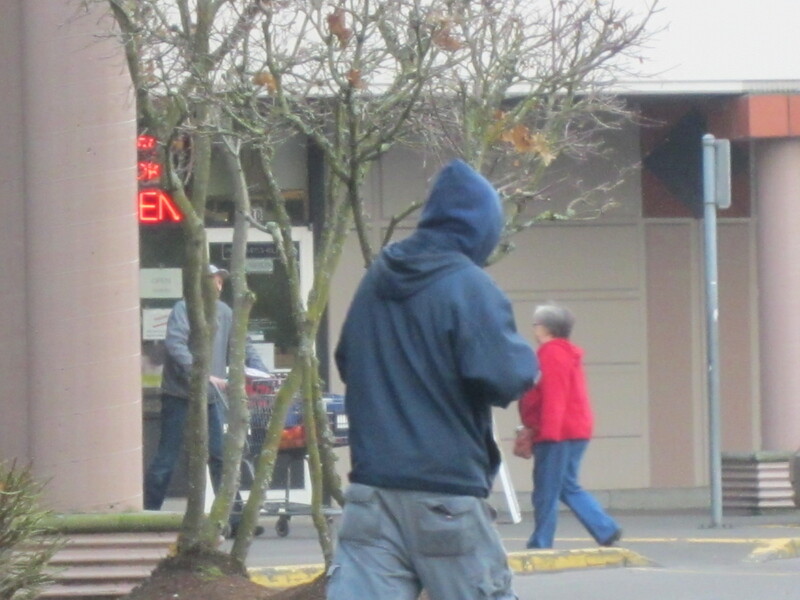 I passed a well-dressed older woman who was pushing a walker, slowly making her way toward the parking lot. 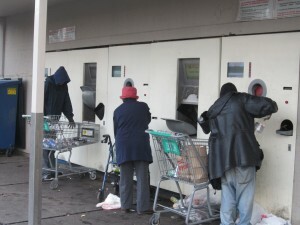 I walked right by the bottle return on the way to my car and stopped for a minute to watch two guys expertly load bottles and cans into the machine. Out of the corner of my eye, I saw the elderly woman approach. I had assumed she was taking her groceries to her car, but in fact her reusable shopping bag was filled with cans. She looked out of place among the trash and empty beer bottles strewn about. One of the men, tall and dark, glanced up from under his hoodie and noticed the woman. “This one’s free,” he said, pointing to one of the slots. She said something I couldn’t hear and seemed uncertain about how to use the machine. The man gently helped her then went back to his work. A young woman came up, saying she was looking for the slip from when she had returned her bottles earlier. “I think I dropped it around here. Move your foot,” she ordered the elderly woman, reaching down for a piece of paper under her shoe. The elderly woman put her hand on the young woman’s back for support while she bent down to pick up the piece of paper. “Ma’am? Is this what you’re looking for?” It was the helpful guy, holding out a piece of paper he had picked up from the ground. “Thank you!” the woman exclaimed. Then she ran off. The shorter man finished what he was doing, grabbed his receipt and headed toward the store. The tall guy finished sorting the few cans left in his cart. 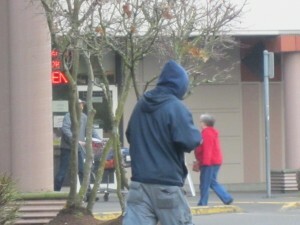 He took one last look at the elderly woman, then started pushing the empty cart to the cart return. I caught up with him. “I really noticed how helpful you were,” I said. “There isn’t enough of that these days.” He shrugged. His hood was pulled up and I could only see part of his face. He looked at me, curious. “Thanks,” he said, then started to lope off. “I have something I’d like to give you,” I went on. I asked his name and he said it was Reuben. “Like the Tribe of Reuben,” he added. Then he gave me a smile and a little wave. And he was gone. Nice to know that Reuben has been gifted with one of your hundreds. I suspect he will use it well. (I had to google “Tribe of Reuben” since I didn’t know what it is.) You’re doing well getting these gifts into the right hands at this time of year, Jill. I enjoy them all.